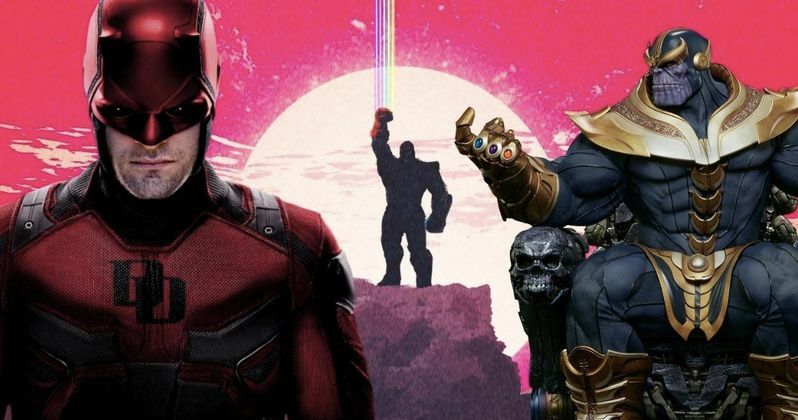 Could we finally see Daredevil join up with his big screen Marvel counterparts in Infinity War? The prospect still seems incredibly unlikely, but there's now some evidence that suggests maybe, just maybe, we're going to see some crossover between the worlds of The Defenders and The Avengers. This is something fans have wanted for a long time and, at the very least, it looks like the street-level Marvel heroes may get a shout-out in Avengers: Infinity War, as hinted at by some recently leaked LEGO sets. An Instagram user was studying the recently leaked LEGO sets for Avengers: Infinity War. While paying very close attention to detail, he noticed that there's a very definitive, but very easy to miss Easter egg referencing Daredevil. This doesn't mean he's for sure going to show up in the movie, but it's worth taking a look at. Here's what he had to say about it. "Recently, the Avengers: Infinity War Lego set was leaked online, giving us a good look at the heroes and villains. One of the sets include a newsstand that previews the New York Bulletin where the one and only Karen Page works. However, the front page titles "Crime Floods the Street" including a red figure with horns and his trusty club, indicating that this figure might in fact be The Devil of Hell's Kitchen! It hasn't been confirmed that this will be in the films, but it could be Lego hinting towards a connection to the Netflix hero(es)." It's certainly true that what shows up in these LEGO sets doesn't necessarily appear on screen in the movies. For example, there was a Doctor Strange LEGO set that is set in the Sanctum Sanctorum and features some sort of giant tentacle monster attacking the magical home base of Marvel's resident sorcery expert. This didn't appear in the movie, but LEGO had some fun with it. So it could very well be that LEGO is just giving fans of the Netflix Marvel stuff a little something for the sake of it. We know that New York City will be a major location in Avengers: Infinity War. That being the case, it's going to be tough to totally ignore the fact that The Defenders, Daredevil included, hang their hats there. But Kevin Feige and other brass at Marvel Studios have indicated that, for the most part, crossover between the movie side of things and the TV side of things just isn't going to happen. Still, this discovery, as seen on the_marvelous_guy's Instagram, is something worth considering. You can check out his original post below, as well as a screenshot of the Daredevil Easter egg on the LEGO set for yourself below.